Who is to blame for your website problems? Is it national “blame another country week”? I woke up this morning to the news that Google was blaming China for an issue with Gmail. The day before we had the Germans blaming the Spanish for an E.coli food poisoning outbreak. And, following the allegations that the UK Border Agency is not up to scratch, I hear on the Your Call programme on BBC Radio 5 Live this morning that people in this country can’t get jobs “because of people from other countries” coming here and “stealing them”. Whether it’s our jobs, or food poisoning or hacking into computers everyone, it seems, is looking to blame someone else. And that’s not all; I’ve just watched a recording of last night’s Apprentice to find that the less than conquering Vincent was still blaming other people for losing this week’s task as he departed in his taxi. Psychologists call this “locus of control“. When you blame other people your “locus of control” is external, but when you realise it is down to you, that you are responsible, you have an internal locus of control. Entrepreneurs tend to have an internal locus of control, believing they are responsible for everything that happens to them – good or bad. Some people, have a moveable locus of control; when things are going well, it is all down to them, when it is bad it is someone else responsible. Notice how Gordon Brown changed his economic thinking once the recession started to bite? When we were doing well economically it was all because of his policies; but once we fell prey to economic woes, it was “other countries” and the “international economy” that was at fault. Nowadays, though, it appears that more and more people have an external locus of control, whereby everything that happens is someone else’s responsibility. In particular this appears to be happening with younger people. I only have anecdotal support for this with my contact with university students, but it seems to me that younger people are more likely to have an external locus of control. I suspect it is all down to school league tables – in order for schools to succeed, the system prefers it when children are shown the way, where much more is done for them, where failure is not an option. The result is that over the past 20 years or so our schoolchildren have got used to other people doing much more for them than in previous generations. And that means that for many online businesses the very generation coding your sites, designing your pages and running your e-commerce operations are less likely to feel they are in control of what they are doing. If it goes wrong, it’s down to someone else. If it goes right, it’s nothing to do with them either – it’s just because that’s what you asked for. But it is not just the younger generations who seem besotted by blaming others these days. In my workshops I find that older generations are increasingly seeking to blame others. Their website doesn’t get top ranking because “of Google’s unfair system”. Their pay-per-click campaigns cost too much because “their competitors bid too high”. Their website fails to convert prospects into buyers because “the designers didn’t do their job right”. 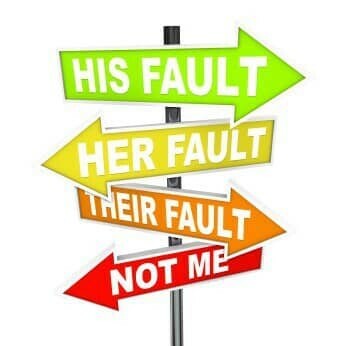 The blame game is rife in the online world. Here’s the truth: if your website is not working as well as you would like – it is YOUR FAULT….! And the best and quickest fix? Change your locus of control – realise that what happens to your website is more down to your thoughts and actions than anyone else’s. Google don’t need to blame the Chinese, but instead look inside their own organisation as to why the problem could have arisen in the first place. The Germans don’t need to blame the Spanish; instead they need to think about their own procedures that allowed the tragedy to unfold. And the people who blame immigrants for “stealing their jobs” need to stop focusing on them, instead looking at themselves and how they can boost their own competitiveness and attractiveness to employers. Oh – and the remaining candidates for the Apprentice? That’s easy: listen to Tom.